The key to losing weight and effectively keeping the weight of is eating an ideally balanced diet that regulates the body’s hormone levels. Imbalances in hormone levels, which typically occur due to stress or exposure to certain toxins in the environment, make it exceedingly difficult for people to lose weight, even if they follow a strict reduced calorie diet and exercise on a regular basis. In fact, exercising too much can actually cause an imbalance in hormones and increase appetite. Created by Natasha Turner, a naturopathic doctor, the Supercharged Hormone Diet focuses on attaining perfect hormonal balance in the body. To achieve this, the diet is split up into several different stages. The first stage of the Supercharged Hormone Diet is a two-week long detoxification that clears the body of excess amounts of hormones such as cortisol and estrogen. After the two-week detoxification phase, dieters gradually reintroduce foods into their diet over a period of two more weeks to learn which foods are not properly tolerated. During the next phase of the Supercharged Hormone Diet, dieters begin to follow a Glyci-Mediterranean Diet, which helps dieters to maintain stable blood sugar levels by consuming a low-carb Mediterranean Diet. High protein foods are an important part of the diet, as they help to stimulate growth hormones, encouraging fat burning and an increased metabolism. During the detoxification stage, dieters avoid all inflammatory and allergenic food, including sugar, caffeine, alcohol, gluten, potatoes and dairy. Oils, oranges, tangerines, grapefruit and peanut products are also avoided. Taking nutritional supplements during the detoxification stage of the Supercharged Hormone Diet helps to reduce food cravings, increase resting metabolism and encourage the breakdown of hormones. Recommended supplements include fiber, vitamin D-3, and a probiotic. After slowly reintroducing different foods to the diet during the second phase of the diet, dieters should be able to figure out the foods that do and do not work with their bodies. The final phase of the Supercharged Hormone Diet, the Glyci-Mediterranean Diet, involves replacing high carb foods with high protein foods, nuts, vegetables and olive oil. Drinking lots of water and beginning meals with salads or soups to decrease hunger is advised. Additionally, drinking whey protein shakes as an afternoon snack can help to lower insulin and control appetite. Exercise is considered a crucial component of the Supercharged Hormone Diet. Turner recommends yoga and strength training to build and maintain muscle, in addition to four half-hour cardio workouts. Performing more cardio-intensive exercise could increase cortisol levels and slow down weight loss. People following the Supercharged Hormone Diet generally can expect to lose between 5 to 12 pounds during the initial detoxification stage. The glyci-Mediterranean diet is shown to encourage both short-term and long-term weight loss, but the diet is not primarily focused on weight loss. Its goal is to restore and maintain internal health. Additionally, eating the glyci-Mediterranean diet can help to reduce cholesterol and blood pressure, and decrease a person’s risk for developing heart disease. Other health benefits associated with the Supercharged Hormone diet include controlling and possibly preventing diabetes. The diet is considered excellent for diabetics because it focuses on lowering the intake of high-glycemic index foods. The Supercharged Hormone diet typically includes less than 30 percent of daily calories from fat, which is great for overall-health and fitness. Sample menus typically feature about 42 percent of daily calories coming from protein, which is a little bit higher than the amount of protein recommended by the U.S. government. Additionally, while the U.S. government recommends eating up to 65 percent of daily calories from carbs, the Supercharged Hormone diet features only about 30 percent of daily calories coming from carbohydrates. Overall, the Supercharged Hormone diet is relatively easy to follow compared to other popular diets. The initial two-week detoxification phase of the diet is definitely a challenge, but if dieters can make it through this phase, the glyci-Mediterannean diet allows for eating tons of great-tasting foods and does not ban any food groups entirely. Very convenient, the diet allows for eating out at restaurants and once a week cheat meals. Although alcohol and caffeine are banned during the detoxification phase of the diet to encourage hormonal balance, they can be consumed in moderation afterwards. If you’re overweight and feeling down, The Supercharged Hormone diet may be just what you need. By balancing your hormones, you can get into the best shape of your life and feel great. 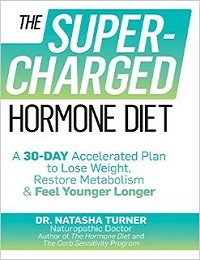 For more information about the Supercharged Hormone Diet from Dr. Natasha Turner herself you can also check the video below… Have a great day! « CT-50 Review – Is This Bodyweight Workout System For You?